Producers have a lower investment cost because the dealer purchases and is responsible for base station upkeep. Dealer networks cover more area with the RTK signal, giving many producers access to RTK on all of their ground. 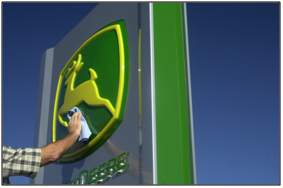 RTK network is owned, maintained, and supported by a local, certified John Deere dealer. 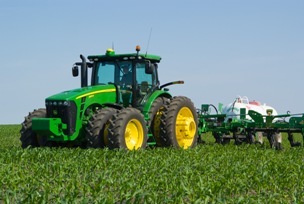 Contact a local John Deere dealer to inquire about RTK network coverage. RTK repeaters are radios that can be used to improve base station signal coverage around obstacles, such as trees or rolling terrain. The purpose of the RTK Repeater is to receive the correction signal coming from the base station and then transmit that correction signal. More than one repeater can be used with one base station, but the repeater cannot receive signal from each other in a daisy-chain configuration. In order to operate, a repeater must be connected to a 12-V power source. A repeater is the same as the radio that is on a machine or base station receiver. With many RTK solutions, automatic guidance simply stops working if trees or rolling terrain interfere with the line of sight between the base station and the machine. That is not the case when using RTK with John Deere, thanks to RTK Extend capability. RTK Extend allows AutoTrac to keep functioning for up to 15 minutes with RTK accuracy without line-of-sight to the base station. When using StarFire 3000 Receivers, the machine receiver automatically goes to the SF2 signal when RTK Extend expires. This allows operators to take advantage +/- 5-cm (2-in.) accuracy along tree lines or hilly terrain. The availability of SF2 provides RTK users with the best available accuracy by lessening the impact of any given field condition. The machine will transition from RTK to RTK Extend, to SF2, and back to RTK without disengaging AutoTrac. 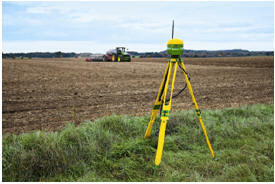 StarFire™ RTK provides highly accurate corrections to the AutoTrac™ guidance system. It utilizes a local, ground-based reference station that transmits the high-accuracy +/- 2.5 cm (1 in.) corrections to a machine StarFire receiver via RTK Radios. Because of the proximity of the base station to the machine, nearly all satellite drift is eliminated, and the position is highly repeatable. In order for the base-station signal to reach the machine, a direct line of sight is required.